Nevada men's basketball coach Steve Alford speaks in front of almost 1,000 Northern Nevada community members during the announcement of his hire Friday. Close to 1,000 people showed up at the Lawlor Event Center to welcome Steve Alford, who was named the Nevada men’s basketball head coach during a public announcement. The Wolf Pack Marching Band opened the event while community members took their seats in the arena, staring down at the basketball court, which had a layer of blue and white confetti sprinkled on top of it. The crowd was a mix of longtime fans and students, including C.J. Christensen, a junior at the university. He says he is optimistic about the new coach, given Alford’s prior experience at UCLA, where he led the Bruins to four NCAA Tournament appearances, taking them all the way to the Sweet 16 three times. Christensen says attending games in the student section is what he’s looking forward to. Musselman’s departure left some Nevadans surprised and disappointed, but Brian Park-Li says it is evolving into an opportunity for people to come together. ”It hurt, and I think it was a little bit bitter for a while, but I think people are rallying around him leaving, like we all feel it together, ‘Hey, he left all of us, not just the team,” Park-Li said. Musselman is gone, and Alford has inherited a basketball program that has reached a new level of success over the last few years, winning the last three Mountain West regular season titles. 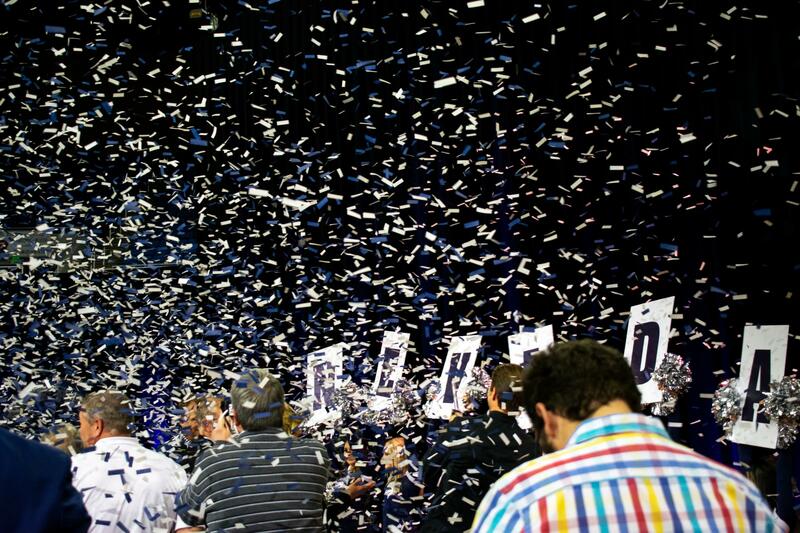 Confetti, fireworks and Wolf Pack fans filled the Lawlor Event Center to welcome Steve Alford. In the past few years, Musselman created community involvement within the basketball program, re-energizing the local fanbase. In his first speech, Alford pledged his commitment to do the same. That's important for fans, like Dale Clark, who has been a loyal supporter for 15 years. Under Musselman, the public was able to sit in on open practices, which gave Clark the opportunity to build a personal connection with the team. Alford comes with a suitcase of experience having coached at five universities. He's also a gold medal Olympian with experience playing in the NBA. As a college head coach, he’s led his teams to the NCAA Tournament in 14 different seasons, 11 times at the Division I level. He’s also coached 11 NBA draft selections, and seven of those players were chosen in the first round. Alford says he chose Nevada for three reasons: the fans, the players and the climate. The coach says he’s excited to build the team’s culture and identity in order to out-work and out-think the competition. Nationwide, close to 21 million people are living with diabetes. Ninety percent of them are living with type 2 diabetes but just 10 percent are diagnosed with type 1, which can be debilitating. Trey Porter is a type 1 diabetic as well as a division one collegiate athlete serving as a starter for the University of Nevada, Reno men’s basketball team, which has gained national attention. Nevada men’s basketball player Jazz Johnson recently scored a career high of 27 points in his game against Air Force. As a junior, he’s been awarded two Mountain West Conference media honors, Sixth Man of the Year and Honorable Mention. The team recently won its third consecutive regular season championship. Off the court, Johnson reflects on the sacrifices it’s taken to be in this position. KUNR Stephanie Serrano sat down with him to talk about his upbringing, family, and his younger sister Nyame, along with, of course, the Mountain West tournament. After a 6 a.m. phone call from head coach Eric Musselman, Gus Argenal left his head coaching position at Cal State East Bay to join the Nevada Men’s Basketball team as the assistant coach in the summer of 2017. Argenal sat down with KUNR to give an inside look at what it takes to help coach the 24-2 Nevada Wolf Pack.